20 years ago, Tim Barber had a car crash. Over the intervening years, he had overcompensated for the damage to his right knee by placing extra stress on his left. “Gradually, over a period of time, I’d worn away all the cartilage in my left knee and ended up with bone grinding on bone,” he explains. 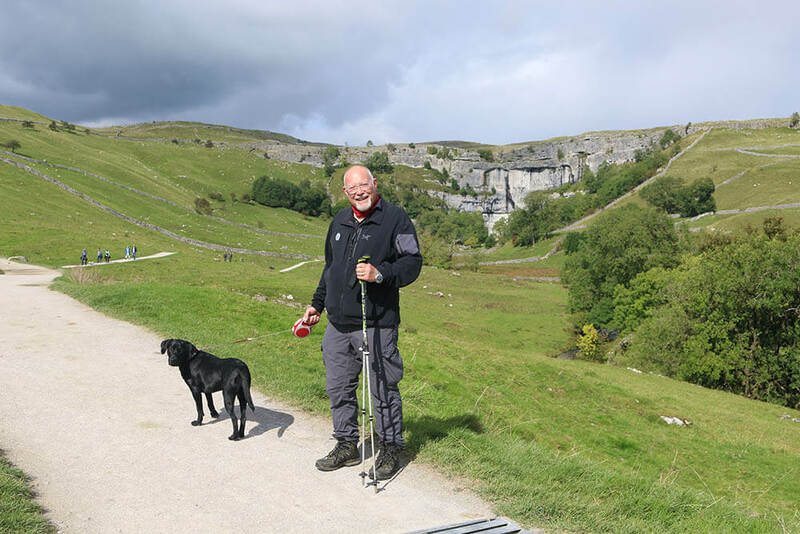 Within 2-3 weeks, in April 2018, Tim was heading to Harrogate’s Duchy Hospital for private knee surgery. “Check-in at the hospital was all very easy and I was first in theatre that day,” he states. “I was advised to have an epidural because you recover quicker and you don’t have the grogginess of a general anaesthetic. As soon as the physio had gone, Tim set about ensuring his discharge. “I remembered from a previous knee op how to do stairs with sticks, so I nipped back down the corridor, practised a few times and then was fine for when the physio came back. All told, I was in for just over a day. “Once home I was initially using two sticks when going up stairs, just for confidence. I was down to one within a day and walking without sticks within a couple of days. Six weeks after his operation, Tim returned to see Dave for his check-up. “I was able to walk in unaided without any form of limp, and Dave was delighted with my progress,” he says. “By then I was back working and walking as normal. On reflection, how does Tim feel about his partial knee replacement and his experience with Dave? “The care at the Duchy was stunning, and Dave’s care and attention to detail – it was probably beyond the call of duty. You meet some doctors that may be technically excellent but they can’t communicate. Dave’s manner is such that you really understand what’s going on. He shows you models of joints. He’s honest about the pros and cons and what to expect in recovery and that knowledge really helps when you go through your recuperation. “I wouldn’t hesitate to recommend a partial knee replacement. It’s such a simple procedure with such a quick recovery time to get rid of pain and enable you to do what you used to do. And I wouldn’t hesitate to recommend Dave as the person to perform the operation. To speak to Dave Duffy, or our team about your knee consultation, please contact us.